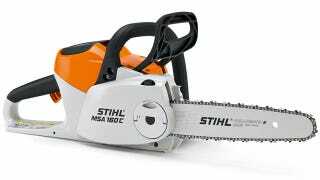 Chainsaws have been used to clearcut forests and terrorize teenage summer camps, so Stihl is hoping to put them in a more friendlier light with their new electric model that swaps the cord for a sixty minute rechargeable lithium-ion battery. Not only is it a greener alternative to gas powered models, but the lack of a fuel tank and gas engine makes Stihl's $350 MSA 160 C-BQ Chain Saw quieter, lighter to carry, and you don't have to deal with those messy fuel and oil mixtures. With a 36-volt lithium-ion battery it will happily slice through trees and lumber for up to an hour, so you no longer have to measure up to Paul Bunyan if you dream of being a lumberjack.